In this article, we help you to learn How To Get All Photos Off Your iPhone Xs/iPhone Xr/iPhone Xs Max on PC Computer by using our iPhone To PC Transfer software - SyncBird Pro. Make sure you have downloaded the latest version here before continuing. It seems as though Apple hasn't upgraded the iPhone Xs/iPhone Xs Max camera on specs page, but actually the latest iPhone XS Max did bring many under-the-hood improvements in regard of photo taking and video shooting. It's the same dual-camera system as before: A 12-megapixel standard lens with a f/1.8 aperture, paired with a 12-megapixel telephoto lens with a f/2.4 aperture. Both have optical image stabilization, and the image sensor is now larger, however, which helps with better low-light photos. To many Windows PC users, it would be a persistent topic that how can I get all my photos off an iPhone Xs/iPhone Xs Max since I don't have iTunes on my Windows PC. In this guide, we'll show you how to handle this task in few easy steps (Learn How To Transfer Photos from iPhone to Computer). You can get photos off your iPhone Xs/ iPhone Xs Mac to your Windows PC by connecting your device to your computer and using Windows Photos app. It requires the latest version of iTunes installed on your computer. iTunes - Make sure that you have the latest version of iTunes on your PC. Importing photos to your PC requires iTunes 12.5.1 or later. Photos App for Windows - View and edit your photos and videos, make movies, and create albums. Try video remix to instantly create a video from photos and videos you select. 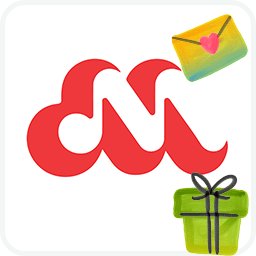 Import photos from a variety of devices including iPhone, GoPro, Sony camera, etc. You also need a computer and USB cable to connect your iPhone to your Windows PC computer. 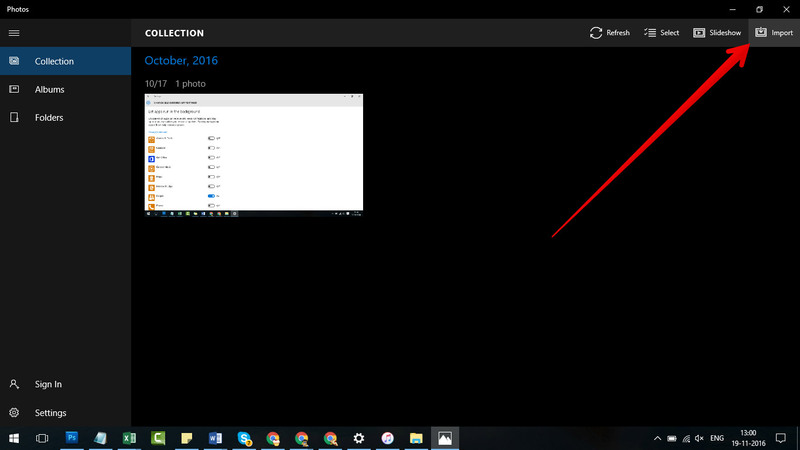 Step 1: On your Windows 10 PC, select the Start button and then select Photos to open the Photos app. Step 2: Select Import > From a USB device, then follow the instructions. You can pick the pictures you want to import and select where to save them. Windows 8 OS has little differences with Windows 10. You can get your photos off your iPhone Xs/iPhone Xs Max with the Windows 8 in-built Photos app. Here are the detailed steps. Step 1: Connect your iPhone Xs/iPhone Xs Max to your Windows 8 PC computer by using an Apple's USB cable. Step 2: Open the Photos app > Select Import > Select the device you want to import from > The Photos app will automatically search for all photos and videos that it hasn't imported before > select the ones you'd like to get off your iPhone and click Import to start. Windows 7 PC computer can also detects your newest pictures on your iPhone and doesn't import duplicate versions of older pictures that you've already get off from your iPhone to your PC. Follow steps below to import photos from iPhone to your Windows 7 PC. Step 1: Connect your iPhone Xs/iPhone Xs Max to your Windows 7 PC computer by using an Apple's USB cable. 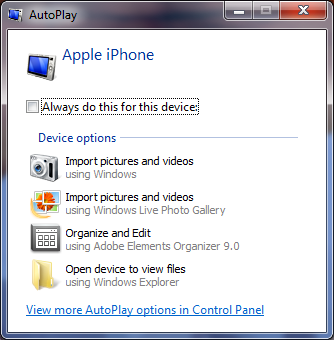 Step 2: In the AutoPlay dialog box that appears, click Import pictures and videos using Windows > Click Import to start getting photos off your iPhone to your Windows 7 PC. The alternative method to get photos off an iPhone Xs to a Windows PC computer is by using photo cloud services like iCloud, Google Photos, etc. This way you can always keep your photos synced between all your devices. One more thing, as a perfect iTunes alternative for macOS, SyncBird Pro can help you add/sync your photos, videos, podcasts and other iOS content between your iPhone, iPad, iPod and Mac. Free Download now to have a try.